In linear barcode font products (Code 39, Code 128, Interleaved 2 of 5, UPC-A/UPC-E, EAN-13/EAN-8, POSTNET, Royal Mail, Code 93 and MSI/Plessey), a GUI program, termed as Morovia FontPal is included. With this program you just need to type you data and press a button to make a barcode. Using the Encoder, you can preview the final output of the font and copy/paste the barcode into a word processor, editor, or graphics designer. To start FontPal, double click its icon on the desktop. Or you can access it through Start → All Programs → Morovia → Morovia FontPal. Below shows creating a EAN-13 barcode (click to enlarge). Barcode Type — Select the barcode format. This box displays barcode formats installed on the system. Barcode Options — Select optional options such as check character and whether the human readable text is displayed. In this case (EAN-13), check character and human readable text are required, so the check boxes are grayed out. Height Options — Each font package provided 5 height options - XS, S, M, T and XT. Message to be Encoded — Enter the data encoded here. Barcode String — This is the string that becomes the barcode after being formatted with font. Depending on the barcode type, it may be completely different from the data encoded (such is the case in EAN-13). Make Barcode — Press this button to refresh the barcode display. Copy to Clipboard — Copy to clipboard so that you can paste to word processor and graphics designer programs. Code Facts — You might want to read them when you run the program. It provides insights on the barcode format. Options — Access further options. Print — Print test sheet of barcodes. Current Font in Display: — The font name selected to create the barcode. This is useful if you need to find the font name used. 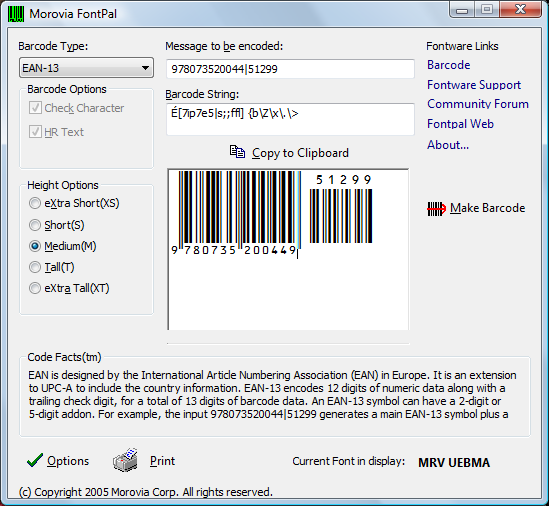 FontPal is shared among multiple linear barcode font packages. It locates barcode fonts installed automatically and show the barcode type box accordingly. If you are creating EAN-13 barcodes, you should have UPC/EAN Fonts installed, otherwise EAN-13 will not show up in the Barcode Type box.